Each year Father’s Day comes around. And each year since my Dad passed away I think about how much I have grown, how much my life has changed, and how much my heart has shaped me into the person I am today. I think about all the things I have done since he has passed and it seems I have lived a lifetime without him. But then again it feels like he has been there every step of the way. And he has been there with me…in my heart. You see my Dad gave me his heart: his big, strong, passionate heart is the same heart that beats inside me. There was never a moment when he was still living that I doubted he loved me. Every night he would say goodnight and tell me he loved me, even through high school. Every time we said goodbye, he’d say, “Love ya!”. I was never that girl who got her heart broken by boys in school. Honestly, I never really had time for them or cared to have a boyfriend. During my school years, I just couldn’t find the boy I wanted to give my heart to because it already belonged to someone else…my Dad. He was the only man I needed in my life. He never disappointed me. He was a role model on how to love. He loved my mother so very much, and I alway knew I wanted, no needed, to find a love like that. He helped me create the expectations of the man I needed to give my heart to. And I always knew it was going to take a while to find that man. Left: My parents as an engaged couple. Right: My happily married parents dancing at my cousin’s wedding. He was my first dancing partner. He taught me how to eat Oreos. He’s always looked after me. Now he does from a higher view. It wasn’t until I was 19 that my heart was broken for the first time. On November 27, 2009, my Dad broke my heart. I couldn’t believe that he was the one to first break my heart. But then I had to understand he answered God’s call to go home to heaven. Although I was heartbroken, it didn’t last long. You see, something else happened on that November night. As I was at the scene of his accident, I overheard my mom say, “What are we going to do about Sarah?”. Everyone was so worried how I would be after he died because I was very close to him. After I heard her say those words, it was like someone had picked me up and wrapped my heart with assurance that I would be just fine. And I know who did that act I needed so much right then and there. 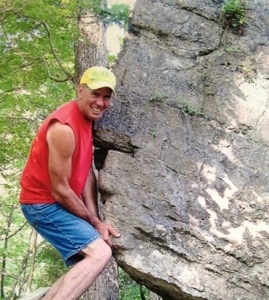 It was my Dad healing the heart he had just broken. But my heart didn’t heal overnight. Over the course of these six-and-a-half years, I have pieced together my heart with the help of my friends, family, God, and my Dad. I am happy to say that now my heart is healed. I know my Dad didn’t mean to break it, and I am the person I am today because of my once broken heart. I am also so grateful for the people who have helped me heal it. I pray that it will never break into those many pieces again, but that’s “just part of it,” as my Dad would say. Part of this thing called life is about all the pieces it takes to make it a great one. And I know that he is so very happy that my heart is healed and how I have given it to a man that far exceeds his and my expectations, the Fish Farmer. Now, I am looking forward to everything my healed heart has to give in the years to come. Me and the Fish Farmer who has my heart. To sum it up, my heart is full this Father’s Day, and I wish all those Fathers out there a day of heart felt wishes and a blessed day. To my readers, thank you for giving me an outlet to share stories of my Dad and the story of my once broken and now healed heart. To my Pops, thank you for giving me your heart. My Dad loved Oreos. We ALWAYS had them in this jar labeled, “Munchies” because that’s exactly what he would do after dinner. He would munch on a couple of Oreos or a couple spoonfuls of apple sauce. It was weird but it gave him his sweet tooth fix I guess. This is one of my all time favorite pictures of my Dad and me. I don’t know why because it goes to show even at a young age I was a messy eater. But Dad was always right there beside me so I could use his shirt sleeve to clean my face off. I blame that act on why I seem to always forget to grab a napkin when I sit down to eat. But I love how he is right there beside me, bent down to where it looks like he is telling me something. I am sure he was just sharing with me lessons on how to eat an Oreo. But then I bet he got tired of telling me how to do it, so instead he showed me. 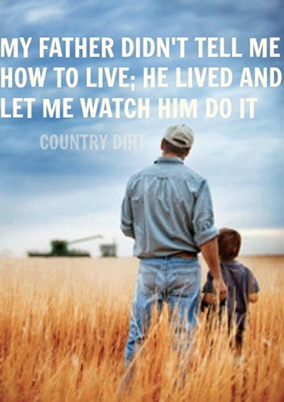 Dad was always right there beside me if or when I needed him. He was there in all his silent yet very much known presence. Dad was never critical of my mistakes or decisions. He never really told me what to do. He SHOWED me what to do. The man was ALWAYS on the go and you just had to learn to keep up if you wanted to learn anything from him at all. He was a role model in the truest sense. He modeled how you should care for yourself, and for others. Whether it was working all day long at the farm, Sunday nights, rainy or snowy days the man never could sit still for long. I remember during the winter months when there wasn’t much physical labor for him to do on the farm, he would go down to the basement and jump rope. Jump rope for what seemed like FOR-E-V-ER (read that in the voice from that kid on The Sandlot). And I could never get out of that jump rope session, especially during basketball or volleyball seasons. “You need quick feet Sarah,” he’d say as I counted my jumps and he’d take a seat on the couch after he was done with his jumps and change the channel to AMC or TCM to find an old classic movie to watch. I remember asking if I should stop so I wouldn’t be in his view of John Wayne or Gary Cooper. So I would say nothing to him but start my new count of jumps. He also showed me how to be strong…..
And he showed me how to have a sense of humor. 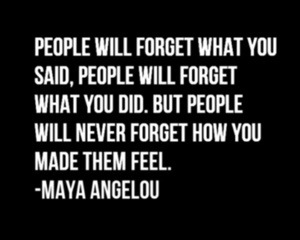 The thing that I took away most from my role model was how to treat people. He had such a way with people. Through his actions you could tell that he really did care about his friends, family and even strangers. The man was a great friend to have. He was there if you needed help or if you just wanted to have a good time. He had friends of ALL ages. He could go to dinner with the camping group, otherwise known as “The Village”, but end his night hanging out with my sister, me and our closest friends. He was old and young all at the same time. 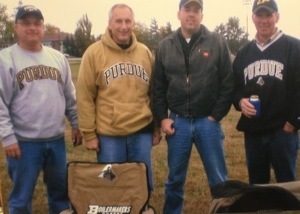 He loved going to Purdue Football games and meeting up with his college roommates. 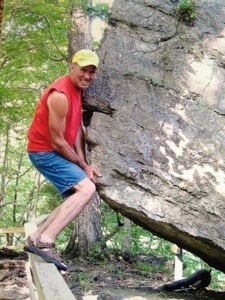 He loved going camping and to the Elks with the men from The Village. He loved taking me to volleyball practice and starting a game of horse with some poor girl’s bored brother on an empty court. 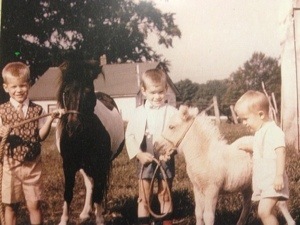 He loved working along side his first friends, his big and little brothers on the farm. He loved sitting around a fire with my sister and her friends drinking Miller Lite and jumping over badminton nets with the boys just to show them he’s still got it. He just loved being around people. You want to know how I know he loved all these things? Because he showed up, asked how they were or how he could help. He SHOWED up. 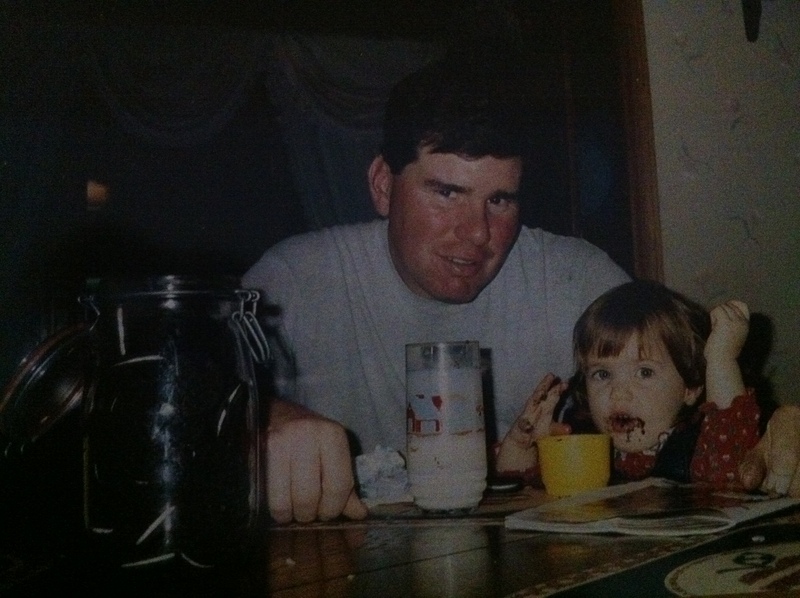 To sum it up, thanks Pops for showing me how to eat those Oreos and so much more. 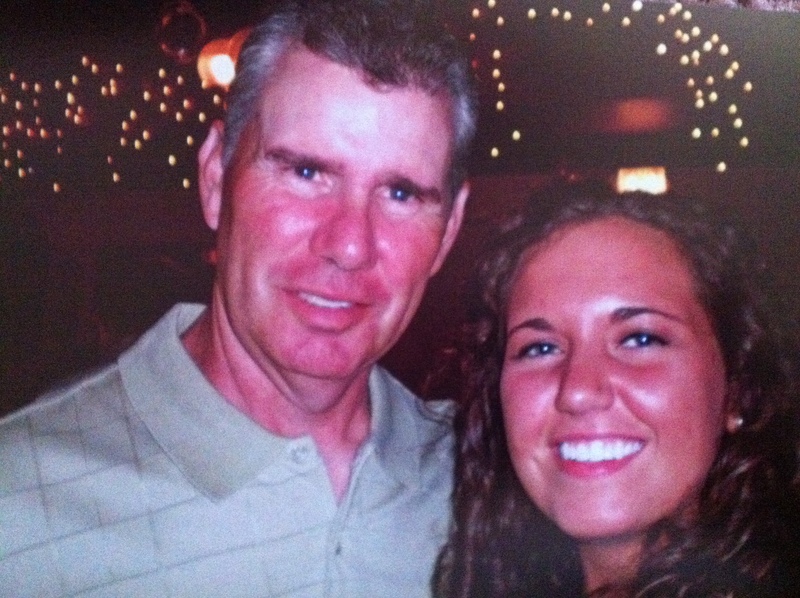 Read more lessons from my Dad here and happy Father’s Day to all those dads out there!